Tags: Ethics, healing, Novels, PTSD, Star Trek Deep Space Nine, What makes a family, What makes a person? Star Trek is always at its best when posing tough questions to answer. Star Trek Deep Space Nine was a series that tackled politics, religion, bio-ethics, and war quite in your face. It wrestled with grieving, PTSD, mental health, and shell shock. It showed the stark contrasts needed for Truth and Reconciliation for the Bajoran people and their planet when the Cardassian occupation ended, and the Federation led by then Commander Benjamin Sisko came to the formerly Cardassian space station Terok Nor (renamed Deep Space Nine) to aid the healing and rebuilding process. Sisko who would become the Emissary in the Bajoran religion. The wormhole that opened between the Alpha and Gamma Quadrants that the Bajoran people saw as the Celestial Temple in their faith, and the shape shifting aliens existing within as their Prophets. But I digress from my theological geek ways, to focus on another tale that is tackled well within Deep Space Nine. David R. George III (2017) The Long Mirage brings forward an intriguing question. Especially with the rise of hate filled populism thinly veiled in religious language today in our world. The original DS( has been destroyed and replaced with a shiny new Federation station. A Bajoran Federation officer is now Captain, Ro Laren, and she is sweet on Quark (the Ferengi Ambassador, former barkeep on DS9 and hub of creative financial opportunities). They are searching for a missing patron of the station. Kira Nerys, former first officer, is now on a spiritual quest that has taken her through time and space literally at the will of the Prophets. She has seen and learned things that may be a benefit to some factions in new Bajor. What as a believer do you do with what you have learned? She is caught between the Federation rules of silence on time travel, her religions free will on disclosure, and those who want to use the faith of the people as a political tool. Then Quark and Ro find Morn (the patron) and he is caught with illegal holograph technology…. Why? Trapped in a program buffer since the original station was destroyed. The holodeck program has had some glitches, and Easter Eggs that have put Fontaine’s life at risk. So what you say, hit reset and carry on. Only Fontaine’s 1940’s era Vegas casino and act has been a place of community building, healing, and sanctuary for many on DS9. Quark’s nephew, Nog, when as a cadet lost a leg in the Dominion War lost himself in the world and Fontaine became his therapist to work through the PTSD and Shell Shock. What makes a friend? A member of the family? And the core question, is Fontaine a sentient being (person) or not? Enjoy the read, and wrestling through the questions. Seems a rather stark choice in life. Braga and Matalas lay out this stark choice in their 2013 Star Trek the Next Generation mini-series collection The Hive lays this choice out. For a former philosophy major (yes one of my 7 undergraduate majors before finally graduating, I will not disclose how many schools but 5-6 would not be a bad guess) I love these debates. It was like my ethics final paper where an angel and demon play a poker game over Superman’s soul (shortly after his “death”), to illustrate positive and natural law. This is another dichotomy story line that involves Captain Picard’s old nemesis, the Borg Queen. Picking up the themes from the 2-parter, Best of Both Worlds and the second cinematic movie, First Contact. Set on Enterprise-E, after Voyager’s return. Picard is once more hearing the call of the Hive Mind. Now he is hatching a plan with Seven of Nine. There is fun temporal acrobatics, a feisty lieutenant that believes once a Borg always a Borg. Wonder how she feels serving under Captain Picard, formerly Locutus? and terminate the Borg threat permanently. So here are questions to ponder. Is it truly a zero sum game? Do you commit one genocide of trillions to halt another genocide of multi-trillions? Can someone authentically change or heal from who they were? How do you know? How do they know? Why? Well why not (and last I checked it was my blog lol). Anyways it is also a way to explore some issues in lifespan development we may not want to touch upon. It relates to a three arc novel (unofficial trilogy) by Kirsten Beyer in the Star Trek: Voyage book series. That being Protectors (2014), Acts of Contrition (2014), and Atonement (2015). I will attempt my best to not reveal any spoilers in the action, as it is quite a fun read through all three books in the adventures of Starship Voyager with Captain Chakotay at the helm, and Vice Admiral Janeway (recently returned from the dead) in charge of the Full Circle Fleet back in the Delta Quadrant. There are some ethical questions that arise within the series, it would not be Star Trek without it. In no particular order we have to deal with Admiral Paris’ widow challenging Tom Paris (first officer of Voyager) and B’ellana Torres (Voyager Chief Engineer) for custody of their child, siting them as unfit to be parents. It is a balance of battle between family dynamics, hurt, fear of the unknown, grief reactions, and what family believes is best for a child. Follow that with the parallel that there is a plague attacking Federation worlds, and a mysterious wing of Starfleet Medical has “recruited” or “captured” the non-Borg ala Axum and Seven of Nine to mine them for a cure. Raising the question of medical ethics, and what price is life to be saved? How much of one’s own humanity– ethics– morals can one let slip away to achieve a goal, and what exactly is the goal of the medical facility? Is it to treat a plague or create a weapon? The challenge of going from crisis to crisis. What is love? As Chakotay and Janeway continue growing their relationship. What is the definition of family? What does it mean to support family? How far would you go to save a family member? In the midst of all that, Mrs. Janeway (Katherine’s mother) makes a comment that I believe is very astute for us in this day and age, as we journey through Lent to reflect upon. She points out that Janeway was educated not in the streamed schools for Starfleet academy, even though her parents knew that was her destiny. Their goal was to give her as broad an education as possible through the public system so that she could be exposed to many interests, activities and knowledge. Stop and reflect on that. As our public education system continues to move to more specialized schools. As parents have over programmed children that during the Polar Vortex in Calgary recently parents were freakin’ out on Facebook because they had already done all these activities with their kids and had no idea what to do next. Before a child leaves elementary school we want them to know their future. Then we sit and wonder why the rise in anxiety and mental health issues within children. We have to read experts saying to allow kids to be bored. The rise of social media and the ability for anyone to publish an opinion that others will quote as fact. Algorithms that eventually keep you in an echo chamber online. We have a history and knowledge of humanity at our finger tips, but are unable to process because learning is no longer an endeavour to simply learn, and critically think. What if we paused and realized there is time for specialization of expertise later in life. That as one ages and grows a passion for learning and hobbies needs to be nurtured and developed. How to fill boredness with creativity and interests is not done through scheduling and programming, it is done through being present in life and connecting with a child, with another human being. As the mentors of the present generation, we need to allow growth and understanding, exploration and learning. It is about discovery. It is about passion. It is about knowing who your child is, but being a rounded person able to human, means not just streamlining to specific interests for “job prospects” but to become a fully enriched human being with a passion for life long learning. What else happens when you have that innate curiousity cultivated? You are able to think outside yourself, your own self-interest and selfishness. As such you are able to have empathy, compassion and love for others. The question then is changed from, how does this effect you…to a better one as to how this creates a loving community (world ) of belonging for all? Christopher L. Bennett’s Star Trek Enterprise Rise of the Federation: Live by the Code (Pocket Books, 2016) raises the ethical dilemma in a pre-Prime Directive Star Trek Universe. For the non-initiated (or those who live without fun), the Prime Directive is the oft-shrugged away rule of non-interference that the United Federation of Planets abides by in pre-first contact interactions. As this series has come together, it challenges the early Federation (Earth-Vulcans-Tellarites-Andorians) working together on how to bring their different methods, values and ethics together as they continue to explore the Universe and face challenges. Among them a capitalist AI run amok- The Ware Corporation. We all try to live according to our principles, but we cannot control whether history will remember us as heroes or villains. Sometimes, those of us who take the boldest actions in support of our beliefs are destined to be remembered as both. It is a technology that replaced all sentient species on its home world from the work-exploration forces, and now out in the galaxy to continue its growth requires sentient brains to survive and grow. Hence the dilemma, some stations are quite aggressive in seeking new “fuel” sources. While others are in a forced symbiosis with the Partnership. A collection of pre-warp cultures/worlds that have found a way to not be used up (die) as fuel for the Ware, but find a way to switch volunteers in and out of the system. Thus having their societies benefit from actual technology though living in constant fear of what had come before. It is on the Federation’s Radar with Captains T’Pol and Reed, due to the aggressive nature of the technology and trying to end its spread. 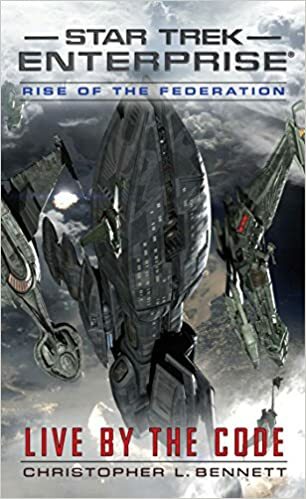 An ethical dilemma for the species in the Partnership would not be where they are technologically without the Ware, yet the Ware had decimated much around them, and as a result of the Partnership, had brought war from neighbouring planets. Ends and Means. Is it worth the price? What if the Federation does not stop its spread? While the cube squeezes tightly as the Klingon Empire on the brink of civil war due to an augment disease that had created humanesque Klingons (think those from the original t.v. show) who function as privateers of the space-ways but now see their way with the Ware to conquest of their home world. While the Matriarchal Orion Syndicate squeezes the ethical standard of the Federation more by forcing a possible hand where they must decide in propping up dictators for needed supplies or not. There are no ideal solution.s here, Jonathan. You should’ve learned that by now. When the galaxy is falling down around you, you have to prioritize whom to save. And yes, Shran and Archer’s ethical conversations continue as to what direction needs to be taken as the galaxy is on the precipice of chaos fueled by hate over hope once more. The galaxy’s struggle brought down to a family microcosm on Denobula, as Dr. Phlox’s daughter is to be wed to her second husband (of three, Denobulans are Polyamorous, in which each wife has 3 husbands, and each husband 3 wives). This daughter has stepped out of the protectionist practices of Denobula and has married a human, and now an Antarran (for the second think of a British Protestant marrying an Irish Catholic in Northern Ireland in the mid-20th century). As hate attempts to disrupt wedding with a less enlightened sibling who murders her soon to be father-in-law. The question left hanging is what is forgiveness, reconciliation and family? Do actions define an individual? And when the roles become reversed, can mercy be found? Yes, a few more spoilers than I like in a reflection, but it is to show what diving in to a story can raise question wise. Many outcomes are reached by surrendering what we hold to be true. And the flip is that many outcomes can be lost due to holding what we hold to be true. Or, will the means leave lasting harmful repercussions that even if the result is good, was it worth it? Star Trek: Deep Space Nine is one of those shows. Moving aside from what you believe about the controversy around it appearing as Babylon 5 (uber-geeks like me get it) or the Avery Brooks could not have a shaved head for a few seasons out of fear fans would see him only as Hawk (Spenser for Hire). It is a show that should be contemplated during Holy Week (and Lent) or really can be used to create a youth group exploration of faith/religion/spirituality/ethics across labels. It is set on a space station that was once used as a key of an occupying species (Cardassians) over an entire planet and species (Bajoran). When the occupation ends, the Federation comes in to aid the Bajorans in rebuilding, claiming the symbol of occupation and re-igniting it as one of hope. There is an intricate religious system on Bajor that sustained the resistance, it is based around the Roman Catholic catechism is you watch closely, but is quite universal. A wormhole opens to a new quadrant, it is seen by believers as a Celestial Temple, with the “wormhole aliens/shape shifters” that exist within seen as Prophets. The Bajoran religion grew out of pantheistic roots to the belief in the tangible Prophets and Pa Wraith demons that were active before the occupation, and are active again. Commander Benjamin Sisko’s first contact with the Prophets brings him to the intersection of Star Fleet Prime Directive and those he is aiding’s religious beliefs as Sisko becomes The Emissary. That is enough of an ethical discourse. Throughout though the show looks at race relations; in one episode of time travel it looks at the battle for equality within 20th century America. There is another when as Emissary, Sisko is left on the cusp of death, and his son, Jake, must wrestle through the ethical challenges of medically assisted death outside and inclusive of the ethical foundations he knows as a Federation citizen and the role/beliefs his father had been developing around his life as Emissary. What is using God’s name in vein? For too long we have said its using God’s name as a swear, this is pure bullocks… it is using God’s name to justify your actions that are wrong (contrary to Love) or it is using God’s name/blessings in your life for your own personal gain instead of just being in awe of the love that has come. This confirmation lesson was brought to you by the letter L for Love like Jesus, and the number 19 (cause 12 close men, and 7 close women=19, Jesus original inner circle). There is also the touch on genetic (eugenic) engineering, with Dr. Bashir and the illegal enhancements his parents put him through. But also the quandary that because he could “pass” he was allowed a life. While those that could not were institutionalized. A great allegory to the debate/historic throwback/current existence of persons with disabilities. 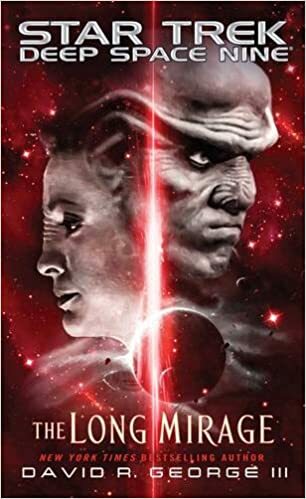 The underlying story of transformation of the Ferengi Family and Rules of Acquisition in Quark, Rom and Nog as they become more involved with the Federation. The guard of the “other” being let down. But the tiny ripple effect as the curve ball of the misogynistic capitalist species becomes shook to its core when their Mother decides she should wear clothes, and… make her own money. Worf coming to grips with being a father, and that his son, needs to be affirmed for who he is, not chase who his father thinks he should be to save his life during the Dominion War. The Dominion War story arc that creates the ethical debate of war, invasion, how far will you go, what are ethics in war, blindly following an ideology, why the young are first drafted, fear, death, loss, grief, how allies are chosen…but also the role religion and belief play in the outplay…also in the increasing rise of the story line through their final season to the conclusion that was the ultimate story of redemption, where the answer of the whole occupation of, where were the Prophets? Is finally answered. If you have seen the series, you may seen the bread crumbs I have laid out. If you have not, I do not want to provide spoilers, but it is well worth exploring. At the least for great writing, characters and science fiction. At most, it is a useful tool for discourse, exploration and growth. A treatise on Christian ethics, Living in the World: Christ and Culture, and Living by God’s Grace: Spiritual Maturity (hereafter referenced as Treatise) is a unique primer by an unknown author on how a Christian (by their definition) should come to ethical conclusions in life. The work has a strong beginning as the author attempts to present his Treatise as bias free. This writing to young Bishop Timothy is used by Treatise to stipulate that all is God breathed so we may live righteously (p.8) due to the fact that “theology is the application of the Word of God by persons to all areas of life” (Treatise, p. 8). This is one of the foundation stones for the moving forward of this treatise, but the essence is that this is an ethicist from the Reformed tradition that is using the Reformists works (and catechisms) before them as a cornerstone in postulating their own primer (p.22). This treatise takes until page 125 to create a clear thesis statement that one can then reflect on the past 124 pages and the rest of the work. This thesis is simple: “The light of God we are to walk in is our ethical guide… God is ethically pure and reveals moral purity to humanity and calls us to live in it” (p.125). As with any treatise, or more manifesto the question is does the author(s) accomplish the task of proving their thesis? From summary to interpretation this is the question that hopefully will be answered by the end of this article. The unknown author(s) of Treatise is quite thorough in their presentation of how to form a Christian ethic. Within the second chapter they thoroughly lay out a glossary of terms so the reader understands the definitions and terminology they are crafting the ethic under. The work continues throughout the treatise as they take the reader through a history of Christian and secular philosophers and ethics. It is a classic back and forth point, counterpoint exploration. Where some religious writers may avoid the conversation of bias, the writer of Treatise opens up that they come from a Christian Reformed background, and believes that this form of Christianity is closest to the Biblical (p.35) and that he wants his work to show a correlation between ethics and God’s lordship (p.22). This is the Treatise’s answer for the Christian tendency to break ethics into two camps of conservative or liberal (p.10) as this should not be the dichotomy but one should seek the Biblical ethic (p.10). This is how Treatise lays the groundwork then to work through the history of ethics, and lay out theorems of the triads to discover if something is ethical, which the genesis within the treatise is good works…the outcome of God’s Lordship for the believer. A heart purified by faith. Work to the right end which is to God’s glory. Command – the authority of God’s moral law. Narrative – the history of redemption in which ethics are shaped through the story of salvation. Virtue – this is the inner character of the regenerated person from virtues listed in passages such as Romans 5:1-5; Galatians 5:22-23; and Colossians 3:12-17. The word as spoken and written (scripture) language (p.130/132). These triads and the reliance on the sufficiency of scripture is then built upon to give one the three creation ordinances: (a) God (worship, Sabbath); (b) natural world (replenish, subdue, dominate); and (c) man (marriage, procreation, labour) are the basic forms of human existence (p.191). The treatise wraps up with revealing the three forms of law found within scripture: moral, ceremonial, and civil (p.201-202). From these the Treatise grows a point counterpoint exploration of the history of Christian ethics, that then explores “hot” button ethical issues as it builds back to the conclusion of the foci being the lordship of God in life. At first blush all seem rather good, yet is the writer as non-biased a reporter as first intended? When one first enters the Treatise it appears to be something different from the norm of Christian ethical documents with the commentary that it is not about liberal or conservative ethics, rather it is about biblical ethics (p.10). Unfortunately, as the old adage goes when something seems too good to be true it probably is. The Treatise contradicts itself when the author ousts all liberal theologians/ethicists as heretics (p.65). This creates a miscue for the reader of this primer because the unrevealed bias is put firmly on display. By this declaration, one begins to understand that what begins to form is not seeing scripture and understanding of scripture as something that is changing rather revelation from scripture becomes static and tied to the literal word on the page understanding. It causes the reader to renew what a Reformed Christian is, and what this means for the ethics being put forward, but also for the material that is to follow opening up the history of ethics and philosophy to the reader. The work would have been better to spend time going point counter point on the liberal-conservative answer to questions, then putting forward the Biblical answer and holding to his original statement from page 10 in regards to this foundation. This contradiction brings the reader back to the statement of God’s revelation being an organism (p.124) as we know through personal revelation, also known as science, that all organisms adapt, grow and change…are we then to be led to believe that there is no changing within the revelations of how to continue to live in our ever evolving world? How do we become salt and light to a world that is vastly different from the one Christ was used to speak into creation, to the one He walked with his disciples on, to the one now where humans have walked on the moon and in space? The idea of God’s revelation as an organism is not wrong, what is wrong is the idea that as a living organism that it cannot be multi-faceted that speaks to many different varieties of believers in a plethora of circumstances. 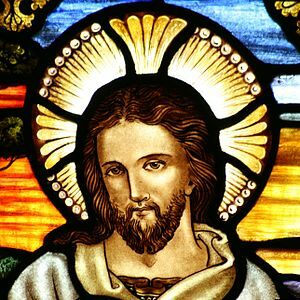 It also calls into question his earlier conclusion that one can be ethical without Christ, yes the Treatise wraps it in the idea of a missing piece but with the illumination of the non-starter on bias then is this truly a held belief or just one more throwaway line for the heretics as viewed? This has created an ethical system of abuse as those with the “education” are then able to create a system of indulgences. The examples are alive from pseudo-Christian movements (Jehovah Witness, Church of Jesus Christ of Latter Day Saints); to cults (Koresh, Jones) to the prosperity gospel movement. When the scripture becomes the final word, what actually sadly happens within the communities is that the interpreter of the scripture becomes the final authority. It is unfortunately all tied back to the scriptural understanding of these norms, which is not just a “Biblical” norm as the Treatise postulates, but rather a Conservative-biblical norm as those that do not fall in line with the narrow understanding are heretics. This is the problem with anonymous treatise being published is that it becomes harder for the reader to compare with previous writings or teachings to be able to see if there is a central theme in the texts or a growth/change of ethos. 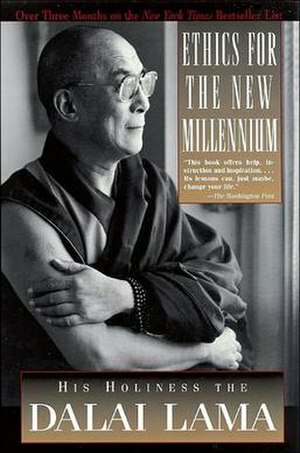 Having walked through all this it comes down though to whether or not the thesis of the work: “The light of God we are to walk in is our ethical guide… God is ethically pure and reveals moral purity to humanity and calls us to live in it” (p.125) still holds up in spite of the unrevealed bias of the presentation? Yes or No to the Thesis? It is not lost on the reader the symbolism inherent within the Treatise. The core symbolism presented for the arguments that unknown wanted forward was a triad or “Trinity” as this is what comes to mind’s eye of the believer while reading and looking at the diagrams: the Tri-unity of the Godhead. This synergy created to support this thesis, the writing around the sufficiency of scripture, the creation ordinances, the three types of law that grow out of scripture, the insufficiency of secular philosophy and the inherent heresy of any non-conservative (Reformed) ethics creates a long winding road to an agreeable outcome. However, this writer does not believe that the road taken is the only way to get to the right end, which is God. For the Anglo-Catholic methodology for coming to ethical-theological decisions is the four pronged stool (the 2.0 version of the three legged stool): scripture, tradition, reason and experience (experience being the newly added leg). The essence being the true living out of the three point revelations of God that the Treatise shared, while Treatise worked towards this understanding of Sola Scritpura, there is wisdom in the revelations. For scripture is the beauty of revelation through God’s living word, which is not just the 66 books of the Protestant Bible (more in other Christianities), no the scripture, the Word of God is the living Word that became flesh and walked with us—Christ Jesus. Tradition is not just the 21 ecumenical councils, but the early church fathers and mothers, the monastic’s, the mystics, the exorcists, the lay readers, the whole people of God and how faith has been lived out over the past 2016 years since the birth of our Lord. This is a wealth of living revelation of God in creation. Reason is just what it sounds like, the art of discourse, the ability to think, to problem solve and to be able to understand good and evil (the knowledge tree of which Adam and Eve ate from). As one Father once said to me, the grey matter in our heads is there for more than just keeping our ears apart and our heads from caving in. It is within the mind that revelations happen whether it is reason as we understand logic, dream revelation, prophecy, for it is through the mind/brain that these messages are then communicated inwardly and outwardly. The final piece of the stool is experience. Each and every individual believer is a piece of the Living Body of Christ here on earth, yet each and every one of us is an individual with our own collective (communal) and individual (personal) experience of coming to know God’s love and living within and without it. Each leg holds up the seat which is how we understand the ethic of God. How we understand the light of God in which we live. The thesis of the Treatise is correct, and the Treatise gets there in one way, while the Anglo-Catholic tradition shows yet another way to arrive at the same blessing. One needs only to ponder what may happen within an Orthodox or Coptic methodology to arrive at a Christian ethic. One goal, many methods or perhaps one well, many rivers as our aboriginal brothers and sisters may phrase it. The thesis we worked through the Conservative Reformed Christian perspective and methodology was: “The light of God we are to walk in is our ethical guide… God is ethically pure and reveals moral purity to humanity and calls us to live in it” (p.125). Through answering whether or not this thesis was correct it was noted that another biased methodology will aid someone in arriving at the same conclusion. The challenge along the path is a rambling path, but the speed bumps and detours that are created happen when non helpful language is employed in the discourse to reach the heart of God. The non-helpful words? Heretic is the most powerful. Once that is taken off the table, for to be a heretic is simply to make a choice of one or another (liberal or conservative; scriptura sola or four-legged stool; Reformed or Roman Catholic) and can come down to a matter of perspective. As long as Christ is the centre, and then the goal is to build God’s reign the dialogue has the cornerstone to move forward, the next step is to ask the Holy Spirit into the discovery. For living in Christ (the living scripture) creates the right environment for believers, when open, to recreate the world into the Reign that Jesus called us to in the Gospels. It makes every believer not just an ethicist, but truly a theologian for “theology is the application of the Word of God by persons to all areas of life” (Treatise, p. 8). To truly live into the love of God is to truly live one’s life out of that transformational love. A treatise on Christian ethics, Living in the World: Christ and Culture, and Living by God’s Grace: Spiritual Maturity may be from one tradition’s perspective, but when one enters into reading it and allowing the Spirit to move, what is revealed is that truly our ways of knowing God and the spirit behind it may not be that different. Unknown. A treatise on Christian ethics, Living in the World: Christ and Culture, and Living by God’s Grace: Spiritual Maturity. Retrieved from https://ntsmoodle.com/mod/resource/view.php?inpopup=true&id=122 on 13 October 2012.